About a year ago, a bag was stolen from my truck and thrown into the culvert around the corner from my house. The bag contained the Bible that my mother had given to me more than a decade before - the one that lit my path as I found my way back home, the one I clung to as my father passed away, the one I read through as my children struggled in their daily walks. It was My Bible, you know what I’m sayin’? After finding the bag floating in the swamp water, my gracious and gallant husband waded out and, for nearly an hour, raked the bottom, attempting to find my Bible. He was able to retrieve all the contents of the bag and even most of what had been inside the Bible’s cover, but he could not find the book itself. 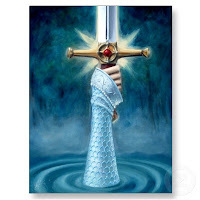 For a while after the event, nearly every time I drove past the culvert, I stopped and stood and stared, as if my Bible would magically rise to the top - like some scene from Camelot. I know, I know. I don’t really want a mud-soaked remnant. It’s just one of my human shortcomings - that thinking that I just need to know. Know what I’m sayin’? I did think I’d given up the ghost finally. However, on recent walks, I’ve found myself stopping and staring long into the swamp water again, trying to discern a bit of leopard print (my Bible cover was cool like that.) Yesterday, what rose up to me was these words, "Why are you searching an empty grave?" "Remember what He said to you while He was still here." Got it. Got it, for real. I do know what I need to know because that Word is alive. There is no grave that can contain it.